Are you a homebrewer with dreams of someday opening up a brewery? Maybe you’ve thought about it, and the task seems daunting and insurmountable by yourself. Local homebrewer Jeff Hicks has been down this road and as a result he plans to launch what would be Seattle’s first cooperative brewery, which will be called Flying Bike Co-op, and he’s looking for like-minded people to join him. If this sounds like something you’d be interested in, keep reading and then contact Jeff about attending Flying Bike’s first exploratory meeting, scheduled for July 24. Following is a Q&A with Jeff to give you some more information. Once again, space will be limited for the meeting, so please get in touch with Jeff prior to attending. Can you tell us more about the idea behind the brewery co-op and what the vision is? As most homebrewers do, I dream of opening a brewery. After many hours of research, I began to realize that the idea is conceptually impossible to do on my own. So, I began to think about how many other guys are out there that have the same dream as me but, are also unable to do it on their own. What if I could find these guys and we could band together to build a brewery and produce great beer? Can you say cooperative business model? So, I started the Flying Bike Co-op here in Seattle with the belief that homebrewers are the heart and soul of what is going on in the craft beer industry today. We bring fresh ideas and expertise that lead to the creation of new beer styles and innovations in the process. Who better to decide what beer the brewery produces! The vision of the coop is to make a gathering place for ideas, a community for like minded people, and a birthplace for some great new beers. Our brewery will not only enrich those who are involved with it, but the surrounding community as well. For those not familiar with the idea of a co-op, can you explain what that means and how the business will be setup? In general, a cooperative is a business owned and democratically controlled by the people who use its services and whose benefits are derived and distributed equitably on the basis of use. Management is controlled by a board of directors who are elected by the members. One unique feature of a cooperative is that each member usually has only one vote in selecting directors, regardless of the amount of equity that member has in the cooperative. Another is that all or most of the directors must be members of the cooperative. Thus, the leaders are regular users of the firm’s products or services. Equity comes from the members, rather than outside investors. It is obtained by direct contributions through membership fees or sale of stock, by agreement with members to withhold a portion of net income based on patronage, or through retention of a portion of sales proceeds for each unit of product marketed. If a cooperative fails, the liability of each member is limited to the amount he/she has invested. Earnings (or losses) on business conducted on a cooperative basis, often called margins, are allocated to the members on the basis of the use they made of the cooperative during the year, not on the basis of equity held. The allocations may be distributed in cash or retained as additional equity. Members usually receive a combination of cash and an allocation of equity. Earnings from business with members are taxed once, either as income of the corporation when earned or as income of the members when allocated to them. A cooperative usually has a perpetual existence. Members can routinely join or resign without disrupting ongoing operations. How can interested people get involved? I would encourage people that are interested in getting involved attend our Exploratory Meeting on July 24th. With the help of the Northwest Cooperative Development Center, I will be presenting the idea to the group to be followed by a vote to proceed. Those who want to be involved further will be place on committees for business plan development. Space is extremely limited so, people will need to contact me for further details about the meeting. Who will be brewing the beer? Although the overall brewing process will be handled by a trained staff hired by the board of directors, they will work in conjunction with a committee of brewer-members that will have a part in deciding what beers we will make. This committee will be made up of homebrewers that have paid a special membership fee to have the chance at getting a recipe of theirs on a tap. We will be holding brewing competitions and let our member-owners decide who the winners are. I think it will spawn a level of competition among our members that will generate some fantastic beers. What locations are you thinking of? Location(s) is a tough one. All I can say at this point is that when the time comes, the board of directors will select a location that will best suit the business and that will give us the best lease options. Seattle is such a vast area, having a broad reach will be hard. Craft brew communities are very localized and their patrons tend to stick to their nick of the woods. One idea is to have our members advocate for Flying Bike beer to be in their local establishment so that they may earn patronage points from drinking there if they can’t come to main pub. We still have to work that out so more to come on that idea. I think people need to know that if they want to get involved with this project, they must love beer. 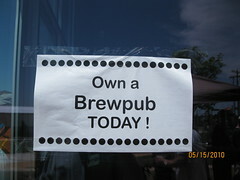 If they love to brew and are looking for a way to get into it, they will have a lot of fun doing this. But, I want to caution everyone, this business isn’t for someone who truly wants to make a ton of money. I don’t think anyone will be quitting their day job so, it has to be for the love of it. One of the benefits of our model is splitting up the work – so many new brewers get in way over their heads because they have to do everything themselves – we will have a team dedicated to this. Also, our brewery will be able to differentiate itself and use the business model as a marketing tool. I believe it is next to impossible to open up a successful brewery in the model of a Rogue, New Belgium, Sierra Nevada, etc. The future of production breweries lies in the fringes – niche categories, or unique and differentiating factors. A brewing co-op would certainly fall into that category. You can also follow Flying Bike on Facebook and Twitter.